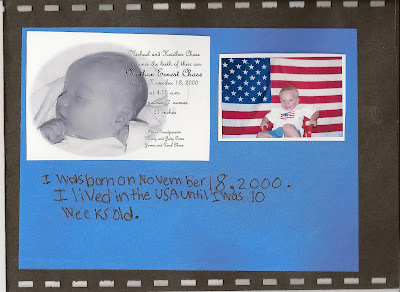 Nathan just completed his first big project in the Second Grade, a timeline of his life so far. It's taken us two weeks to get through the long worksheet and then to create the filmstrip visual that goes along with it. Each grade has done something similar, but this is the most detailed one to date. I'm always a little leery of it, it's a reminder that Nathan hasn't had the same upbringing as the children who were born here in Torrance and will graduate from Torrance High. By his fifth birthday he had already lived in nine places, including two foreign countries. His elementary school is very racially diverse, a fact that pleases us greatly. 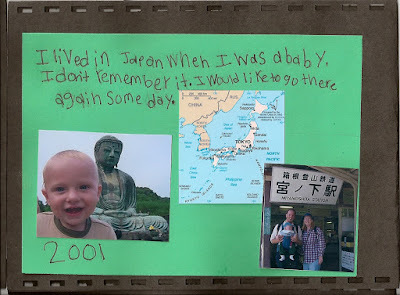 However, last year in the first grade, Nathan mentioned he had lived in Japan and Hong Kong and the predominantly Asian kids in his class took one look at his blond hair and blue eyes and rolled on the ground laughing at what they thought was a joke. His feelings were deeply hurt. Fortunately his teacher came to the rescue and pointed out that he was not telling a tall tale, only the truth. Throughout the year we had opportunities to bring in photos and mementos that showed the places he had travelled to. One very nice thing about the international community abroad is that we are always surrounded by people just like us. No one looks at us in horror when we say we've moved thirteen times in ten years. The most frequent comment is really? Me too! So because we won't be getting this timeline back until open house at the end of the school year, I scanned it. 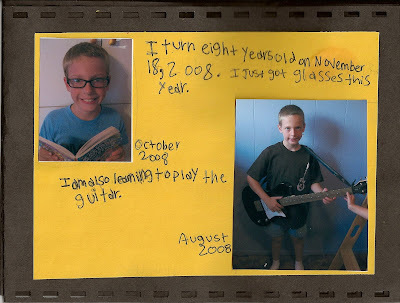 We let Nathan practice the oral report part of this project several times, and I did my absolute best not to let Nathan see that I was getting all teary eyed at my grown up little boy. What a life he has lived! I can't wait to know the man he will become! Wait, of course I can wait! It will go by fast enough I'm sure! 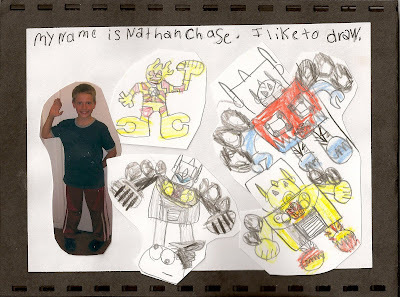 My name is Nathan Chase. I like to draw. I was born on November 18, 2000. I lived in the USA until I was 10 weeks old. I lived in Japan when I was a baby. I don't remember it. I would like to go there again someday. 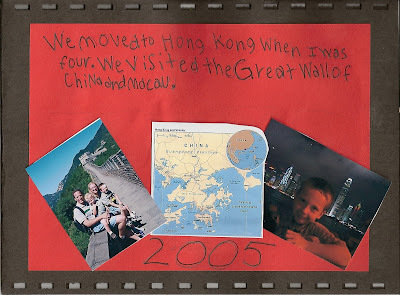 We moved to Hong Kong when I was four. We visited the Great Wall of China and Macau. 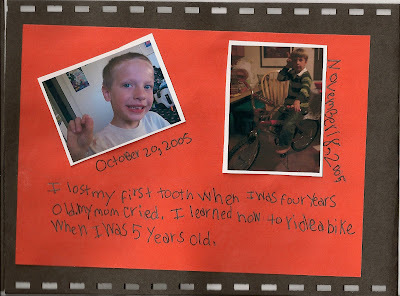 I lost my first tooth when I was four years old. My mom cried. I learned how to ride a bike when I was 5 years old. (Note that in the photo on the left he is holding the aforementioned tooth and that his shirt is all bloody. I did more than cry, I nearly passed out. It was completely unexpected. In the photo on the right he is modeling the bike he just opened for his fifth birthday. We don't normally let him ride it in the house). I turn eight years old on November 18, 2008. I just got glasses this year. I am also learning to play the guitar. that's great!! I love it - great job Nathan!!! !